Rated 5 out of 5 by Pattisue63 from More than I expected! This game got just about everything right. Only complaint is, like someone else said on here: screen/scene changes could be smoother, but everything else about this was so great, it didn't matter that much. Outstanding graphics and music, puzzles and HOS just challenging enough, but solvable with a little thought and without taking so long and becoming frustrating. The bonus game play was longer than I thought it would be, too. I would recommend this game 100% to anyone. Rated 5 out of 5 by b10645727 from Great Game! An all-time favourite! I thoroughly enjoyed playing this game! The storyline is captivating, the music is great, the artwork.. fantastic. It was really easy to follow the scenes and I did not have to check hints to find out what to do next. The HO are easy to find and the puzzles can be achieved without the need to skip them. I loved this game so much that without hesitation or preview I bought the next Maestro. The bonus game is quite long, thorough and is in line with the story. I highly recommend this game; it is amongst the best I played thus far, if not the best! Rated 5 out of 5 by BlackWaterRules from This Game Has It All I would have purchased this game for the soundtrack alone, or for the hidden object scenes, or for the dark storyline, or for the beautiful graphics, or for the original mini puzzles. But I got the whole package. The music is haunting, eerie, beautiful. The Hidden Object scenes are fun and challenging. The mini puzzles are puzzlers and a lot of fun. The storyline is compelling, the player always wondering where the game will take him next. Excellent top quality. Rated 5 out of 5 by sandebeach from Skulls'n'Roses - Awesome Game! PLUS SIDE: I just replayed this game, and I enjoyed it as much as when I originally played it several months ago. The replay took me about 3 hours for the main game, and about 50 minutes for the bonus chapter. I did use the integrated Strategy Guide because I got stuck a few times. You play as a detective who is called to a town where a mysterious illness is killing the inhabitants, and you are asked by a mother to help find her missing daughter. From the opening moments of the game I was immersed in the storyline, the game play, and the eerie but beautiful music which is part of the theme of the story. 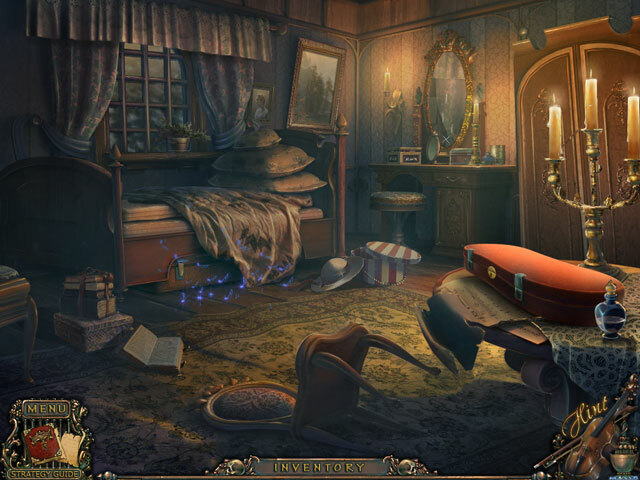 There are lots of Hidden Object scenes, which you will visit twice. 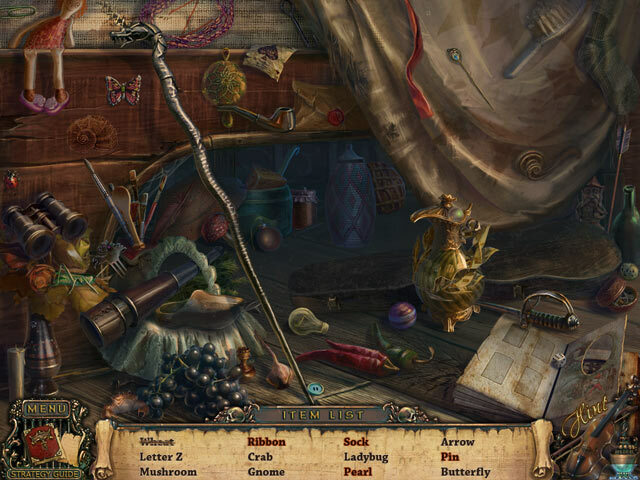 There are many interactive items in the Hidden Object scenes, which were fun to figure out. I liked the fact that there were more Hidden Object scenes than mini-games. However, this is one of the few games that I have been able to play all the mini-games without tearing my hair out (I am not a big puzzle fan). There are also lots of inventory items to find and use, although they are not always immediately available when needed. The graphics are wonderful, as are the cutscenes, and I really liked the music in this game. You will visit five major areas in the town, and you will revisit these areas in the bonus game, along with some new areas. The bonus content includes a chapter that introduces the sequel game, along with the usual extra bonus content - wallpapers/screensavers, concept art and music. I have liked almost all of the games from this developer (such as the PuppetShow series, Shadow Wolf series, and Grim Facade: Mystery of Venice, among others) and I am looking forward to the sequel for this game. MINUS SIDE: The only minus for me was that as the game progressed, some of the Hidden Object scenes became darker in color and cluttered, so it took patience to find all the items. Rated 5 out of 5 by teacherspet from A good game for the money I enjoyed the original game and very much enjoyed the extended version. The HO's are easier to see than in most games I've played. The puzzles are solve-able, some with a little time, but I think I only skipped one. The story line stays consistent into the Collector's Edition, which isn't true for all games. It opens up new areas, too, which is cool. Overall, relaxing and entertaining. Rated 5 out of 5 by biggirl57 from Adventure, Suspense, Mystery It really held my attention in the regular version, and so I am definitely am getting the CE!! I want to see what that old hag is going to do this time! Great game BFG keep up the great games like this one!!! This will be rough estimate of games i have bought. Around close to 100! Everyone will love this game! 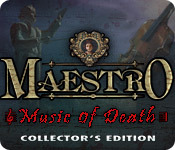 Rated 4 out of 5 by smoovasbutter from Interesting This is the first game of ERS' Maestro series. A musical themed gothic horror game. Interesting concept. A bit of a warning for those who don't want a challenge, the HOS' are quite difficult and the hint recharge meter takes forever. I'm looking forward to playing the other games in this series and see how it compares with this. Rated 4 out of 5 by Torpedo1 from Love Maestro Very good game, my only complaints are no collectables, no map, and some HO's too dark in areas to find objects. But the game itself is so good I would buy and add it to my collection. My Son owned the SE and played it through and it was a difficult games but like it through and through. Rated 4 out of 5 by kahfess from Eerily Beautiful The storyline of this game was nice and easy to follow. 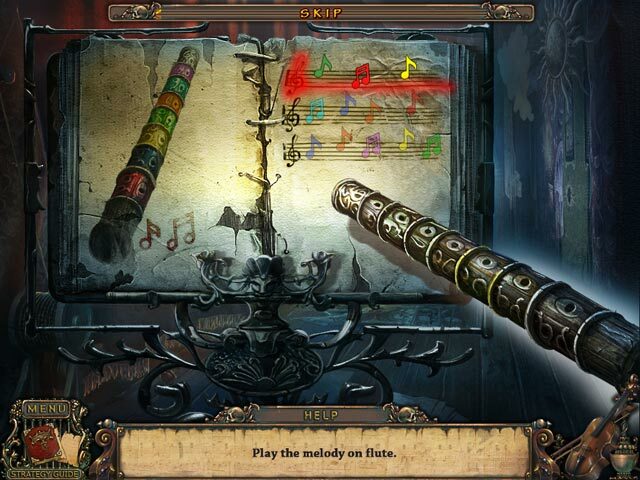 The game play was long, and loaded with puzzles, hunting for solutions to the puzzles and hidden object scenes. The graphics were okay, nothing spectacular, even a little blurry in some areas. The hint buttons charged at a rather slow pace, as did the skip buttons for the puzzles. The extras that come with the collector’s edition include wallpaper, screensaver, concept art and additional game play. The additional game play was long and of the same quality as the game itself. The things that I felt would have enhanced the game play would have been at least a map, preferably an interactive map so you would have to keep back tracking, and the ability to skip the cut scenes. Over all, it was a fun game and I would play it again. Rated 4 out of 5 by Fidelma9 from Bonus game was lame This game makes a good SE game, but don't waste your money on the collector's edition unless you really need to check the strategy guide frequently. But the bonus game is definitely not worth the extra bucks: little more than a series of HOS and almost no plot. I finished it in 45 minutes. Rated 4 out of 5 by shorenuf from Deceptive cadence… * This game was way less challenging than other ERS games, but it is beautifully drawn with some lovely animations. The story is well developed, but leaves you wondering if the sequel will bring you back to the same town. I played in expert mode, so no sparkles. I think I had 3 head scratching moments and only because I had missed a magnifier spot in my pixel hunting. Just check all areas of a location and do not play when tired! What to do with those inventory items is just too well defined in this game for my tastes. The puzzles were easy to tedious (all that work for a key?!) -- not much logic is required. If not particularly challenged, I was entertained -- I must try to accept that sometimes the purpose of these games is to do just that, and appreciate I had something interesting to do with some free time! The Collectors Edition extras: Screen saver -- installation works well. Is it essential -- no. Wall papers -- Well, it was a dark game, so they are too. I may have picked different scenes, however. Worth the CE -- not on their own, for sure. Strategy Guide -- never opened it until I was done. It was well done. It reopens to the page you were on. Essential -- probably not for this game. Concept Art -- it interests me, but should you pay extra for it alone -- no. Music -- you can save the 4 tracts. Oddly, you can see closeups of the sheet music as you click the choices, but the audio doesn't change. I can't carry a tune. Humming the notes was really not a helpful option for me. Again -- if you are into music, you may find these haunting tunes nice company while you work on your Mac / PC. It never is a reason to buy the CE for me, though. Bonus Chapter -- as well done as the rest of the game, and long enough. I never rush through these kind of games, I spend more time than most people, perhaps. I judge more on content. Overall, it certainly wasn't short and there was quite a bit to do. And, yes, it added to the story and gave more completion to it -- but is the drama complete…????????? CE vs. SE -- Spending more for these games profits the developer and we will see more games in the good to excellent range. Very few games are Great. This one had a lot going for it. Overall, very good approaching excellent. * A chord progression that seems to lead to resolving itself on the final chord; but does not. Rated 4 out of 5 by centauri272 from Easy but nice game I spent a good time playing this. The graphics and sound are good. The hint system is also good. The mini-games are quite easy; I skipped only one. The HOS are clear. The game a bit short but I didn't mind. All in all, it was fun and a nice break from all the dark games. Rated 3 out of 5 by Hashby55 from Maestro: Definitely HO I felt that there was a little TOO much traditional HO in this game and not enough other puzzles. Finding the objects in a scene, especially after the 2nd or 3rd time in the same scene got tiresome. Rated 2 out of 5 by DiDi212 from So Disappointed! I played part of the demo and knew I would never buy this CE. It offers nothing I buy a CE for except a bonus game and wallpaper, but I'm not into wallpaper and that type stuff. Let me just tell you why this is an awful game: -- It has no map -- the hint button doesn't do much outside the HOS and it takes a long time to recharge -- the HOS are very easy -- the SG doesn't work in the demo -- no collectibles -- no morphing items I was lost shortly after beginning this game so instead of opening up the walk through, I decided to just leave it and write a review. This game is only 2 years old but it feels more like 5. There are only 2 modes of game play and I chose casual. Please play the demo to make an informed decision. Rated 2 out of 5 by Italia47 from This game is certainly not music to my ears! It's out of tune!!! I'm halfway through this CE version and so far it's doom and gloom; there is no map; you have a deadbeat hint button, and the graphics are grainy, but the artwork isn't bad per se. The game started out okay but went downhill from there. Lots of spirits/ghosts flying around. I mean no disrespect to the developers but sorry, this game just doesn't have it! I'll force myself to finish it. Now the Maestro: Notes of Life was a great game and flowed very well, but this one is dragging and I'm playing it in advanced mode. In my opinion there are way too many HO scenes and the thing is I love HOS; there should be a balance of activities and there isn't. I give this a two-star rating, sorry! I still recommend it because you need to try it and base your own opinion!